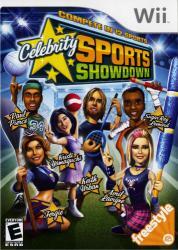 Celebrity Sports Showdown brings the thrill of your favorite recreational sports activities right into your living room. Compete head-to-head in 12 games with celebrity musicians and athletes to see who's got the goods. With intuitive Wii Remote controls and a variety of multi-player tournaments, this fun-filled competition separates the celebrities from the wannabes!